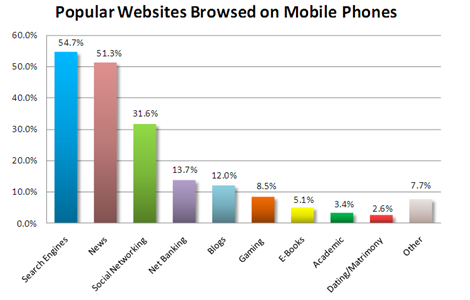 I have been closely following the reports and surveys on usage of mobile phones and its services by Indian users. Today I stumbled upon an Interesting survey by InMobi – the results of which really surprised me. In all the previous surveys and reports, I have been constantly hearing that Mobile or SMS ads hardly engage users. Fifty-seven percent (57%) of respondents browse the internet on their mobile phones, and close to one-third of respondents who surf the Internet through their mobile phones engage with brands that advertise. Of whose who engaged with the ads, they were most likely to visit the ad’s website (72.5%) but also went so far as to call the company (10%), or buy the product (17.5%). Also, the conversion rate of 17.5% of people who engaged in the ads is just phenomenal – If it is true, Mobile advertising may be one of the most lucrative channels for advertisers – but I highly doubt. And most of the reports and surveys previously published reinforce my doubts. According to the survey, the mobile Ads most welcomed are free coupons, free mobile games with embedded unobtrusive ads, money transfer services, free humorous clips and Bluetooth-based “alerts” for items on sale nearby. 20% of the respondents who access the Internet on their mobile phones are from the working class demographic, 38% are from the lower middle class and 42% are from the upper middle class. 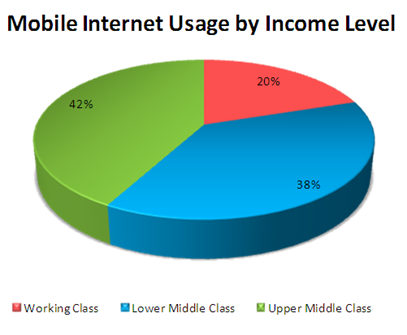 This data shows that mobile Internet usage is not limited to only the upper middle class. Even the above pie-chart is quite perplexing – It says that Lower Middle class access Internet on their mobile phones much more than working class. Now what does Working Class mean, is it Middle class people or lower class people? Little confusing. I am thinking of working class as the Middle Class. InMobi guys – Can you please clarify?